Blog Are you committing this one major act of self-sabotage in your business? Are you committing this one major act of self-sabotage in your business? I really like Sunday mornings. Ever since my daughter was born, going out for breakfast on Sunday mornings has been something of a ritual. Living in Brighton, places to eat are in abundance and we can, if we wanted, quite easily eat at a different restaurant or cafe every weekend. In fact, most weekends we do try to vary where we eat. However, there are a couple of places we gravitate back to more than others. 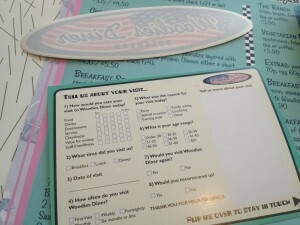 I’m a bit of sucker for an American Diner and there is a wonderful institution on the seafront in Hove called Woodies. It’s just as you would expect. Meticulously detailed with retro furniture, surfboards in abundance (there’s a surfboard shop next door), all the right music playing and Grease and surfing movies in a loop on the big screen. What’s more the food is great. Terrific, in fact, and coupled with the great service the staff offer you understand why you have to get there at 10.30 on the dot on a Sunday to get a seat. It’s a bit popular. And rightly so. You’d be forgiven for thinking I had shares in Woodies with the superlatives I’m ladling onto the business. I don’t. But they are making an incredible mistake, which is probably – actually, most definitely – stopping them from doubling the amount of money I spend with them, which I’ll reveal in a second. When you’ve enjoyed a lovely meal at Woodies, they bring you the bill and wow, what an example to set. You receive the bill on a little metal tray and on this tray is a Woodies car sticker, a heap of sweets and a customer comment card. The car sticker is ingenious, particularly as you see so many of them on the cars around Brighton & Hove. It helps that it’s pretty damn cool, too. The sweets are an obvious but nice touch, but it’s the customer card that stands out. This customer card is incredible. Not only is it the most beautifully-styled customer card I’ve ever come across, the way it asks you for your details is done in a really elegant way. Not only does it request you to rate every aspect of your experience, it captures details about how often you use Woodies, your demographic group, your reason for visiting and adds a space for you to receive offers and news. It is the best example of customer data capture I have ever seen. And it’s also a complete and total waste of space and time. Here’s why. I’ve been going to Woodies for at least a year. I’ve filled out the same form three times in the period I’ve been there. And I’ve not received a single thing. Not a single email, not an offer, nothing. The business is doing everything absolutely right… all the way until it comes to the crunch: talking to its customers. The single biggest mistake they are making is not following up. But, what does it matter, Jody, you still return time after time? Yes, I do. But I’m absolutely sure that if they simply reminded me about how good their milkshakes are, or sent me a picture of steaming stack of my favourite pancakes, I’m not going anywhere else next Sunday. And that’s even without adding an offer in. Look at that list of things they know about me. If you had that information presented to you about your customers, just think how powerful that could be. Immediately, you can see improving the frequency of my visit from every two months to every month would double their sales from me. DOUBLE their sales! And at barely any cost. If you’re looking at that list and thinking, “I’m not sure what I could do with that information…”, drop me a line at marketing@jodyraynsford.com for a chat. Struggling to keep your marketing focus? Let me offer you a hand with my ‘One Idea. Once A Week.’ email for targeted marketing tips you can use in your business today. Sign Up Here.